Who do you think acts as the cook for the Guardians of the Galaxy? Peter Quill doesn’t look like the kind of guy who can cook much more than microwave dinners. Rocket is pretty good at whipping up some explosives out of some old junk, so he’s probably resourceful enough to be a good cook. But he’s also a raccoon and his idea of a gourmet dinner probably involves knocking over a trash can to consume the contents inside of it. Drax looks like the kind of guy who eats mostly raw meat, so he’s probably not suited to being the crew’s cook. And Gamora’s more of the stab-bad-guys-in-the-back type than the bake-you-some-cookies type. That just leaves Groot. Yes, he might be a tree, but he does seem to be the most altruistic of all the Guardians of the Galaxy. If we had to venture a guess, he’s probably the best cook on the ship, since he’s always caring about the needs of others. 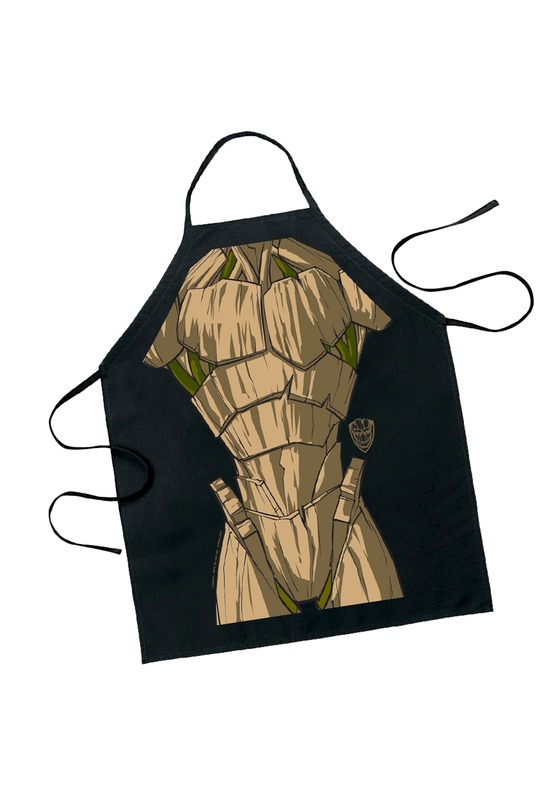 Now, you can try your hand as the cook for the Guardians of the Galaxy with this I Am Groot Apron. This apron is officially licensed from the Marvel movie and has Groot’s body printed on the front. You can wear it while you do some summer grilling, or while you whip up a batch of cookies in the winter. It fits around the neck and ties in back, so it just slips on nicely over your regular clothes. Toss it on and Groot will protect your clothes from getting splotchy with your favorite food ingredients!